In the fall of 1995 I came to know the Lord after a difficult time at my work. I had a strong desire to study God's word and be a witness of Jesus Christ. It was during this time that the Lord put someone on my path who studied at Covenant Theological Seminary. He convinced me that I should study at Covenant Theological Seminary. I applied at Covenant and in the fall of 1996 I started my study in St. Louis. Studying at Covenant Seminary has been a great blessing to me. Covenant was the right place to grow in love for the Lord and the right place to equip me for ministry. After my graduation I went back as a missionary with PMI to the Netherlands. I met Evelien who worked at the Dutch branch of the Voice of the Martyrs (SDOK). We married in 2002. We now have two lovely daughters (Mischa and Yente). In the same year I became a pastor of a Dutch Reformed church (Nederlands Gereformeerde Kerk) in Oostzaan (www.ngk.nl/oostzaan). Oostzaan is a small town just north of Amsterdam. 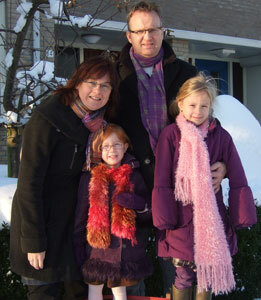 I have been enjoying my work as a pastor in Oostzaan. From the time that I came to know the Lord I have had a special interest in evangelism.